The Rundown: The Teddybears are a Swedish ElectroPop/Hip-Hop/Rock band formed in 1991. The band originally started off as Skull, a Grindcore band. If you’re not familiar with Grindcore, think of guitar riffs that are either heavily detuned or out of tune accompanied by unintelligible screaming and/or noisemaking which is supposed to be like singing. The Teddybears’ music has been used quite a bit for television shows, video games, and more. Their song, Devil’s Music, was featured in the video game Need for Speed: Hot Pursuit. Their song, Cobrastyle, was used in the FIFA 06 and Forza Motorsport 2 video games. It was also used in the ending credits of the film Employee of the Month. Furthermore, Cobrastyle was featured prominently on the pilot episode of the comedy show Chuck. Cobrastyle was also used for WWE’s Summerslam 2006 as the official theme song for the event. Intel had used a sample of the band’s song Different Sound, to promote their Intel Core 2 Duo processor. In 2009, Telus used the song Ahead of My Time in their ‘Downtime’ TV advertisement. If you think that The Teddybears are going to be some nice, soft, child-friendly band, you couldn’t be any more wrong. Don’t let those bear costumes fool you (which, by the way, the didn’t start wearing until sometime around 2006). Nearly everything about this band is harsh and abrasive, but in that harshness there is some really awesome sounding music. That’s not so say all their music is rough sounding. Some of their songs are almost… Poppy. But most of the time this band borders on Rap, which is offset enough by the Electro, Hip-Hop, and Rock in their sound that I don’t even notice or mind. They have a truly unique sound that has evolved greatly over time. 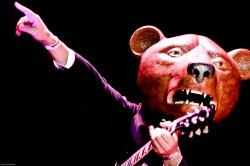 MarsBands.com likes The Teddybears, and we think you will too.